You’ve probably heard the characteristic, majestic hunting call of a French horn. Long ago, these proud instruments were a common fixture in royal hunting parties, until it was discovered, after years of research, that guns worked much better. 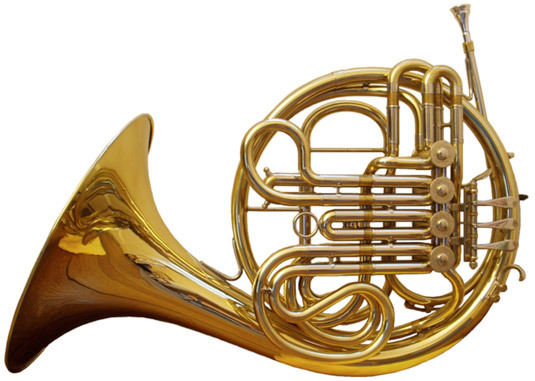 Here’s the lowdown on the French horn. In those olden days, the most common kind of horn was the natural horn. The natural horn was a coil of brass tubing with a mouthpiece at one end and a bell-shaped opening (called the bell) at the other. It had no finger valves or keys at all. To change notes on a natural horn, you had but one recourse: Change the tightness of your lips. That setup worked fine if you wanted to work with a very limited set of possible notes — along the lines of 16. What if you wanted to play some melody too complex for those 16 notes — for example, Flight of the Bumblebee? You’d need a different horn. No problem. Just switch in the 17 nanoseconds between notes. Either that, or you could insert a tubing extension (called a crook). The crook altered the length of the column of air inside the horn, thus giving you a second set of 16 notes to choose from. How convenient! Fortunately, modern technology has solved the nightmare of the French horn player. Today, the horn player doesn’t need crooks. Modern horns have rotary valves. These valves are operated by the fingers of the left hand that — in effect — chop off or add on lengths of tubing, thus changing the horn’s entire pitch. These rotary valves, however, don’t take any responsibility away from the lips. On both natural horns and valve horns, the lips must search out just the right tightness from among many, many possibilities. As the notes get higher and higher, the tightness levels get closer and closer together. As a horn player, you must make infinitesimally small distinctions between notes. Imagine baking a cake, doing your taxes, and reading Braille — all with your lips. Finding notes on a horn is harder. That’s why hitting the wrong note on the horn is so incredibly easy. And that’s why you should be in awe of players who consistently hit the right one. Listen to the following suggestions for some wonderful horn moments. First, for a blazing fanfare, listen to Handel’s Water Music (Track 01) at 0:23. Then listen to the famous horn call in Beethoven’s Fifth Symphony (Track 04 at 0:46). The third movement of Brahms’ Symphony no. 4 (Track 05) has a lovely, lyrical, and short melody for horn (at 3:03). The last movement of Tchaikovsky’s Symphony no. 6 (Track 07) has a horn passage that is extremely low in the range (5:48). Finally, the last movement of Debussy’s La Mer (Track 08) has a gorgeous, quiet, chorale-like passage for all the horns (3:28).